After a 2008 outbreak of listeria killed 22 consumers, Maple Leaf Foods promised it would become a leader In food safety and would share any knowledge it had on the subject with other processors. In Part 3 of our series on food safety in the food processing industry, we talk about food safety best practices from a processor that has been through a processor's worst nightmare. A production line worker reads the label on the Ukrainian Garlic Sausage whirring by her on Aug. 10 and doesn't see milk on the new version of the ingredient statement -- although she knows milk is in the product. So she stops production and informs the quality assurance manager. Ultimately, her actions lead to a recall. What did the company do to her? The plant manager recognized her for her diligence. This is no fictional Land of Food Safety. This is Maple Leaf Foods, where every operator, every employee, feels empowered, even responsible, for food safety. This is the same Maple Leaf that was responsible for a 2008 outbreak of listeria, which killed 22 consumers. Company officials were contrite and forthcoming. They not only vowed that such an incident would never happen again but promised that Maple Leaf would become a leader In food safety and would share any knowledge it had on the subject with other processors. "This was an example of an employee who really stepped up and identified a problem," says Randy Huffman, the American Meat Institute's food science chief for a decade who in 2009 stepped in to become chief food safety officer at the C$5 billion Toronto-based company. He may be the first safety officer who reports directly to the CEO at a major processing company. Maple Leaf Foods, a leading Canadian processor and marketer of meats, meals, pasta and baked goods, operates 27 Canadian plants in its ready-to-eat protein business, which is the focus of one of the most tragic --- and promising -- food safety stories the industry has seen in many years. In a Toronto plant in August of 2008, a hard-to-clean slicing machine harboring Listeria monocytogenes sent up to 1.4 million lbs. of contaminated deli meats to restaurants, hospitals, nursing homes and retail and deli counters. The outbreak took possibly 22 lives, cost tens of millions of dollars and led to intense organizational soul-searching. The company emerged with a very public pledge to instill a "culture of food safety" that commits the company, among other things, to being a "global leader in food safety" and to "openly sharing our knowledge with industry, government and consumers." Huffman stresses that, at the time of the 2008 Listeria incident, the company was going above and beyond government requirements. What went wrong in that 2008 Listeria incident, from a food-safety management point of view, boils down to follow-up. The two elements of a successful Listeria control program, according to Randy Huffman, the company's chief food safety officer, are aggressive environmental testing and an aggressive response to every positive result. "That," he says, "is where the rubber really hits the road." So today, every Listeria test-positive triggers a "seek and destroy team" into action. The team, which includes the plant manager and his quality assurance, maintenance and sanitation chiefs, "attacks every positive result with a tremendous amount of diligence," says Huffman. The members are required to provide multiple hypotheses and investigate each path until a root-cause is identified. "It's a lot of work, but it's not that complex. It's just a matter of focusing on that second element of a Listeria control program, which is actively responding to every signal you get from your testing program." "She took it upon herself to actually look at the label, read the ingredient statement and realize there was nothing in it that seemed to be an allergen. It wasn't in her job description to do that, but that's the kind of initiative we're looking for," Huffman says. "No one person can look out for food safety every day; it's got to be hundreds of people in the plant, every day." Active employee engagement has become the rule rather than the exception at Maple Leaf. To make food safety a way of life, plant personnel and management alike must be trained and vigilant to microbiological, chemical and physical hazards that are typically invisible to the untrained eye. A slew of enhanced food safety best practices and protocols have been instituted from bottom to top. The changes are apparent in structural, sanitary renovations, rerouting airflow and drainage systems and changes on the line to root-out areas of condensation and debris that could harbor pathogens. Procedures have been revamped, evidenced by new equipment wipe-down procedures to new traffic patterns and plant entry points that include restricted-entry turnstiles, "biosecure" handwashing and sanitization stations and boot-scrubbers. And once they enter, employees go the extra mile with shrouds, masks and sleeve covers. The company also has strengthened its daily and weekly environmental, equipment and product sampling, testing and data analysis, doubling testing sites and sampling frequency and reviewing results individually. Sanitization goes as far as sterilizing equipment sub-assemblies and whole systems by baking them in ovens where possible, or covering and steam-sterilizing larger systems. The plants are audited by a third party; subject to quarterly traceability drills; and reviewed by outside auditors in keeping with the latest global standards. These moves provide assurance that Canadian Food Inspection Agency (CFIA) requirements are met, and that hundreds of Standard Operating Procedures and Good Manufacturing Practices are followed in the normal course of each day. 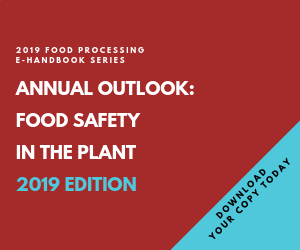 "Everything that we've launched in the last year and a half is centered on the fact that if we don't get folks thinking that way, we'll have a hard time being successful with any of the tactical food safety programs we want to launch," says Huffman. In its desire to speak out on all things food safety, Maple Leaf also thinks CFIA rules could be improved. "We encouraged the government to consider expanding the types of testing methods that industry in Canada can use," Huffman wrote in the company food safety blog this summer. "Speed in learning about a problem early is essential. Currently, it can take too long to get test results back from labs. Better and more rapid methods exist and are being used in other countries that can cut our time to results from about 6-7 days down to 2 or 3 days. Being able to act on results four or five days sooner is a major improvement to food safety, and we think the revised policy should allow industry to adopt those new technologies." Toward the end of continuous, long-term training, the company in April launched a continuing education program in conjunction with the University of Guelph. The company plans to have the top 75 senior leaders of the company through the course -- including CEO Michael McCain -- and the next level of senior management, about 350, by the end of this year. Once senior management is committed to food safety from the top down, Huffman says the company will be "well on our way to having food safety embedded into Maple Leaf culture. Recent food scares remind processors: Pay attention to the basics of personnel hygiene.